Football:Now and In Retrospect… | ItuaLive! The just past football season can be defined by many events: First, the emergence of Borussia Dortmund as new champions of Bundes Liga in Germany, and in France, Lille FC displacing the usual suspects -Lyon FC and Marseille- from winning the French Championat. In Italy it was a different matter altogether; not necessarily that of displacement but a resurgence. The resurgence of AC Milan, the old war horse dethroning a bourgeoning era of arch rivals Inter Milan. In the English Premier League (EPL) we saw Manchester United win the Premiership title for a record 19th time. Manchester United showed character and strength in predictable fashion in what is considered to be one of the most contested titles of all time. The Red Devils displayed consistency on the pitch coupled with a ruthless destruction of opponents when it mattered most. The little Mexican, Hernandez Chicarito proved to be worth more than his sign-on fee as his positioning and clinical finishing was all Manchester United needed to put them above their north London rivals. Chelsea FC’s title race seemingly bit the dust mid season and even with the acquisition of the “mega buys” (Fernando Torres and David Luiz), only ensured that the blues added more excitement and tension to the season run in. The consequence being managerial change. Arsenal… (Where do I start?) the only thing that can be said to have changed is the number of years they have gone on without winning a trophy. Arsenal who were in second place for the most part of the past season managed to finished below Manchester City in fourth place and now have to go into play offs to qualify for a place in the Champions league. They did come very close to winning something as they made an appearance in the Carling Cup finals but then, they always come close. Fate once more conspired against Monsieur Wenger’s side as he saw his team go trophyless for yet another season. Manchester City, the new team to join the “elitist” top four sides seem poised to consolidate their position especially with hands deep into billionaire pockets. They have proved once again that with money and a “good manager”, anything is possible! In Spain, I should be forgiven for focusing on the top two clubs because by the end of the coming season they predictably would still be the top two. For the Catalan giants, the respect of the Merengues is the beginning of wisdom. They might be dominating their rivals now but they know that a step up for the All Whites will make this coming season very difficult. La Liga can be said to have defined the past season the most. It produced the best of everything- the best three players in the world, the best team, and the best coach. The rivalry between Barcelona and Real Madrid transcends generations. The eternal battle between both teams is the stuff classics are made of thus the name El Classico when both teams clash. This “war” doesn’t only exist at club level but rages all the way down to the players. Lionel Messi may be the current world footballer of the year, winning the La Liga and Champions league, and scoring a record 53 goals but Christiano Ronaldo proved to be a torn in the flesh also scoring the same number of goals. Whether this sparks new tension between both players in an already heated situation is discussion for another day but your guess is as good as mine. The mangers of these clubs are not left out of the party. Jose Mourinho a.k.a the Special One is currently the world best coach even though Pep Guardiola won the European Champions league and La Liga title. There can’t be said to be much difference between these successful coaches although I believe that in Spain it is more difficult to remain on top than to climb up the league table. Barcelona are more than capable of holding their own and annihilating all opponents (ask the Red Devils) but nothing lasts forever and their predictable style which is their greatest strength could be used against them. José Mounrinho is a magician that has delivered again and again and again. 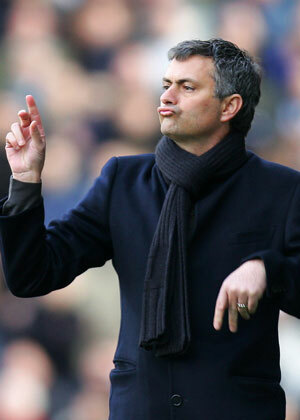 If there is one thing I have learnt, it is not to bet against the Special One. From the modest gains achieved with Real Madrid last season, I think he will achieve more this season. Barcelona may have the likes of Lionel Messi, Xavi, Andres Iniesta and Pedro but they cannot compete as well as Real Madrid in the transfer market especially as the crux of their experienced players in the likes of Xavi, Carlos Puyol and Andres Iniesta are ageing. Real Madrid have completed the signings of players like Varane Coentrao, Nuri Sahin, and Altintop who may not be super stars but make the team more robust in case of injuries. Barca haven’t been busy in the transfer market except for knocking on Arsene Wenger’s door for an elusive Fabregas. Possession football can only do so much when your players can perform week in week out. A long spell Injury to Lionel Messi could see Barcelona struggle and without meaningful buys in the right positions, they might just relinquish their dominance to Los Blancos this time around. I never like to stick my head out like this but should Marseille retain managerial staff and key players; I favour them to win the French league. In Germany, the Bavarians never like to play second fiddle in the land of Budweiser but with the managerial change and reinforcement, they should take the ascendancy. In Italy, I don’t see the Rossoneri retaining their crown; something about them makes me feel they still need to prove themselves. In England, Manchester United is going to face one of their toughest battles to win the league; Chelsea will always give them nightmares particularly with the signing of Villas-Boaz setting off another “new manager” phenomenon. Things will indeed be interesting at the top with so many teams becoming title contenders. It would definitely go down to the wire in England. Liverpool showed enough potential in the second half of last season to tip them as title contenders but with the way they finished, consistency might be their albatross. With manager Hodgson having Suarez and Carrol in the start of a new campaign, it would be interesting to see what challenge they bring against the top four sides. For all Arsenal’s failings, they show a consistency for mixing with the big boys (they are after all one of them) key players or not. These season though, they are more likely to lose key players than sign new ones. The talk of the loss of Francesc Fabregas and Samir Nasri to Barcelona and Manchester City is rife. They have already lost Gael Clichy to Manchester City and other players like Niklas Bendtnar and Denilson is imminent. Wengers philosophy of nurturing young players to stardom would prove to have failed if he loses Cesc and Nasri the way Alexander Hleb and Mathieu Flamini left. It would mean another team building process which would never end. A new season beckons, there are realignment of forces, the champions are not resting on their laurels, and their arch rivals are regrouping, plotting their own elevation. While some plans are disrupted by exits others are strengthened by acquisitions and pledges of loyalty. This is the world of European Club soccer. Will the Red devils make it “20?” Will their new goalie fill the large gloves van der Sar left behind? And what will the new man at the helm of affairs in Stamford Bridge bring to the table? He may have the prowess of his mentor-the Special One- but certainly not his antics with the media. Am sure the new season will be as breathtaking as the last and off course I will be here on itualive! to talk you through it. The wind of change will blow across Europe; how significant will be determined by not only luck and shrewd acquisitions but time.